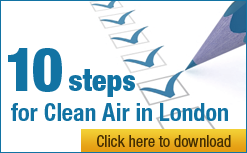 I am writing on behalf of Clean Air in London (CAL) with comments on the above consultation which was dated 7 September 2012 (the Consultation). Please respond to the issues raised in this letter. CAL is a company limited by guarantee which campaigns to achieve urgently and sustainably full compliance with World Health Organisation (WHO) guidelines for air quality throughout London (and elsewhere). CAL is independent of any government funding, has cross-party support and a large number of supporters, both individuals in London and organisations. CAL provides a channel for both public concern and expert opinion on air pollution. CAL understands that the Highways Agency distributed the consultation document to just four organisations listed on page 2 of the consultation document. CAL only became aware of the Consultation by chance through its involvement with Environmental Protection UK. As you know, traffic is a major cause of air pollution which in turn causes thousands of premature deaths per year, and many thousands more instances of illness, chronic illness and disability. The scale of air quality impacts from roads managed by the Highways Agency is very large such that even apparently small ‘relative’ changes are likely to have significant impacts on public health. You may be aware that CAL wrote to the Secretary of State for Transport in a letter dated 15 May 2012 expressing concern that the suspension of the M4 bus lane is unlawful without full mitigation of breaches of air pollution laws. One consequence of the current Consultation proposals, if adopted, would be to weaken (wrongly) the test of ‘significance’ for determining the need or otherwise for a statutory Environmental Impact Assessment (EIA) which may, for example, be highly relevant to the M4 situation. CAL is surprised therefore that the Consultation was not mentioned when it met the Highways Agency on 18 September 2012 with officials from the London Borough of Hounslow. 8. a full public consultation on the consultation proposals is needed in order to provide local authorities, NGOs and other interested parties an adequate opportunity to comment. Limit values are legally binding and must be complied with in full in order to provide minimum public health protections. The consultation document makes little mention of the UK air quality policy context. This is an important omission as there have been significant developments in the policy landscape in recent years that have an impact on the proposals. UK planning law – limit values are a material consideration in the planning system. Developments should not proceed if they are likely to cause or contribute to a breach, or the worsening of a breach, of a limit value unless the impacts are fully mitigated. Limit values are concentrations to be attained and not exceeded once attained. Directive 2008/50/EC also permits a process of compliance flexibility, whereby Member States can obtain a time extension of up to five years to comply with NO2 limit values subject to strict conditions. For the purposes of air quality assessment each Member State is divided into a number of different zones; to obtain a time extension a Member State must submit a plan for each zone in exceedance that demonstrates how compliance with the limit values will be achieved as quickly as possible and in all cases by the latest possible deadline of 1 January 2015. The UK Government did not apply for time extensions for the remaining 16 zones as it did not expect them to comply by 2015. These zones include Greater London where compliance is not expected until 2025. All zones without a time extension may now be the subject of enforcement action by the Commission, as the original 2010 deadline still applies to them. This report admitted the UK had already breached in four of nine zones the terms of time extensions to comply with NO2 limit values. These had been granted by the Commission in June 2012 and are: Leicester, Nottingham, Portsmouth and North Wales. As a result, the UK may face prioritised infraction action in 20 zones. This is a further significant development in relation to the Consultation as it demonstrates again the need for urgent, substantial and sustainable reductions in air pollution. There is clearly no scope for weakening the Highways Agency’s interpretation of ‘significant’. CAL is concerned with the consultation document’s statement that ‘limit values cannot be taken out of context of [Directive 2008/50/EC’s] other requirements and principles’ (5.2.1 on page 16), which seems to suggest there is room for interpretation of the limit values. This is not the case as Directive 2008/50/EC imposes absolute requirements for: air quality concentrations; timescales; and places, unless a time extension has been obtained (subject to strict conditions). Similarly the New Planning Policy Framework is unambiguous on air quality, in that ‘Planning policies should sustain compliance with and contribute towards EU limit values’ (CAL’s emphasis). The Highways Agency’s current ‘approach to identifying significant air quality impacts based on whether or not a scheme makes air quality worse overall in relation to compliance with the air quality limit values’ (4.1.2 on page 12) is not compatible with this policy i.e. new schemes should be actively improving air quality rather than just protecting the status quo. The Consultation proposals would further distance the Highways Agency’s approach from its obligations. This evidence means that it is unrealistic to assume a downwards trend in NOx emissions and associated NO2 concentrations to provide ‘headroom’ for increased emissions from road expansion. Even if the forthcoming Euro 6/VI standard successfully addresses the problems of ‘real world’ diesel emissions it will be many years before this has an appreciable impact on emissions from the UK’s vehicle fleet as a whole. CAL is concerned that these issues are not mentioned at all in the consultation document. They are particularly important as the approach to assessment in the document attempts to consider the duration of scheme’s air quality impact which, in most cases, is highly dependent on the future emissions performance of the vehicle fleet. At the very least, air quality assessments should use appropriate sensitivity analysis to explore a range of possible outcomes. As you will know, the WHO has recently classified diesel exhaust as carcinogenic for humans. CAL is calling for proposals from the Commission during the ‘Year of Air’ in 2013 that will ensure continuity and the further tightening of health and legal protections. Such proposals are expected for air quality legislation in September 2013 or later. In contrast, the Department of Environment Food and Rural Affairs (Defra) has said ‘Working in partnership with other Member States, we will also use the European Commission review of air quality legislation, expected in 2013, to seek Amendments to Directive 2008/50/EC which reduce the infraction risk faced by most Member States, especially in relation to nitrogen dioxide provisions’. The key driver behind air quality legislation is the protection and improvement of public health. Air quality is also an equalities issue; air quality impacts are not experienced equally across the UK, with residents of the most polluted (frequently roadside) locations suffering far greater health impacts than people living in relatively unpolluted areas. Improving public health and reducing health inequalities is at the core of the Government’s public health strategy, as described in the White Paper ‘Healthy Lives, Healthy People’. the proposed assessment approach implies that a scheme is beneficial if pollutant concentrations fall ‘on balance’ and/or if negative impacts are reversible e.g. they may rise at one group of receptors but fall at others in one or more future years. Such an approach takes no account of existing inequalities; suggests it is acceptable for an area where concentrations are well above limit values to deteriorate further if concentrations fall in other, less polluted areas; and confuses the meaning of reversible in Directive 2011/92/EU with the absolute requirements of Directive 2008/50/EC. In short, improving public health, complying fully with binding legal limits and deadlines and reducing air quality inequalities must be at the heart of the Highways Agency’s policy and approach to air quality assessment. This is not the case with the current proposals. Legal requirements were codified in Directive 2011/92/EU dated 13 December 2011. Even a cursory review of the Selection Criteria in Annex III and/or Appendix A identifies, for example, that the suspension of the M4 bus lane triggers the need for a statutory EIA. For example, the characteristics of the potential impact include: a predictable, significant and ongoing worsening of the breaches of the limit values. Table 9.1 on page 40 of the report titled ‘M4 Bus Lane – The Analysis of the Impact of the Suspension of the M4 Bus Lane’ dated 5 April 2012 identified a worsening of NO2 concentrations of between 0.6 and 1.7 micrograms per cubic metre i.e. an increase of up to three per cent. These are significant increases and may reflect increases in harmful emissions of up to six per cent. It would be challenging for a local authority to reverse such increases which might require perhaps the banning of diesel vehicles in the local area. The Highways Agency interprets this as meaning that the considerations in Annex III are exclusive and exhaustive which cannot be drawn from the wording of the EIA Directive. The inclusion of the words “in particular” means that the list is not exhaustive. Therefore the Highways Agency’s view that “it is the criteria listed under Annex III which must inform the determination of whether a project has a significant effect on air quality” is wrong in excluding possible factors that are not listed. Further, in CAL’s opinion, the Highways Agency’s current and proposed screening tests of ‘significance’ might, for example, suggest (wrongly) that a statutory EIA is not required to assess the impact of suspending the M4 bus lane when it clearly is required. CAL has tremendous respect for the depth of assessment provided by local authorities under their Local Air Quality Management duties. CAL considers the UK’s Air Quality Management Areas (AQMAs) to provide a far better picture of air quality in London (and the rest of the UK) than Defra’s national assessment, due to the latter’s relative scarcity of monitoring stations, heavy reliance on modelling and lack of local knowledge. As the consultation document states, AQMA declarations frequently cover more than the simple area(s) of exceedances. This is not simply administrative convenience: it is also used to acknowledge the fact that poor air quality hotspots are the result of (mainly) traffic movements across a large area, rather than simply the area of exceedance itself. A local authority view heard by CAL is that whilst the Highways Agency will help with the assessment of AQMAs caused by, or related to, roads under its management, the Highways Agency is unwilling to take sufficient action to reduce air pollution caused by these roads. Local authorities are unlikely to welcome aspects of the proposed approach to assessment. For example, point 6 on page 20 appears to suggest that new exceedances would be seen as less significant if they are clustered around existing exceedances, as they may be covered by measures in Air Quality Action Plans. Local authorities are likely to object strongly to the idea of further exceedances being created due to road schemes, even if they attached to existing areas of exceedances. CAL also takes issue with paragraph 3.2.5 (on page 11) ‘Our assessment approach does not explicitly consider the presence of an AQMA’. The Highways Agency should consider fully the presence of an AQMA in their assessment and undertake a thorough programme of consultation with the local authority where air quality impacts are expected. Please respond to the issues raised in this letter. I have copied relevant parties.